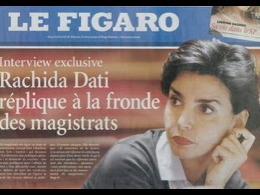 Photo editors at Le Figaro deleted a ring from the French justice minister's hand in order to make her appear less glamorous. 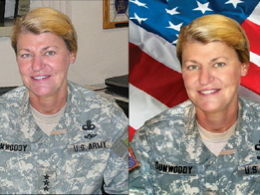 When Ann Dunwoody became the first four-star general in the American military, the Army released a doctored photo of her to the media. 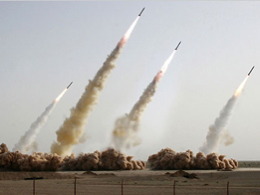 The Iranian government pasted a missile into this photo, apparently in an attempt to conceal the failure of one of the missiles to launch. 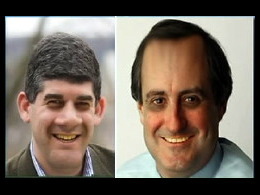 Fox News aired pictures of New York Times staffers that had been digitally altered to make the men appear less attractive. A surreal effect of impossible geometry may have been caused by the use of a telephoto lens to take this picture. 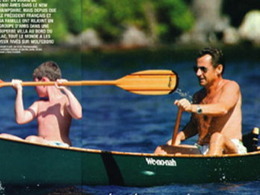 Paris Match was accused of pandering to French President Nicolas Sarkozy when it reduced the size of his love handles in this photo of him canoeing with his son. A digitally slimmed down version of Katie Couric appeared in CBS's Watch magazine. 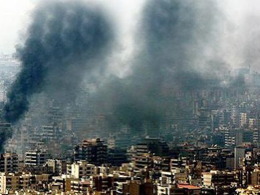 A freelance photographer heightened the drama of this image distributed by Reuters by adding additional smoke. Published in 2006. Debunked in 2008. 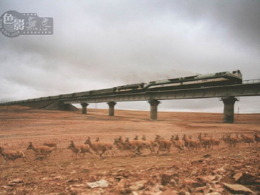 This award-winning Chinese photo appeared to show the peaceful co-existence of antelope with a new high-speed train. Unfortunately the photo was a digital composite. 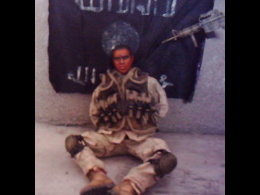 Hostage "John Adam," whose photo appeared on internet bulletin boards used by Iraqi rebels, turned out to be a Cody action-figure doll. 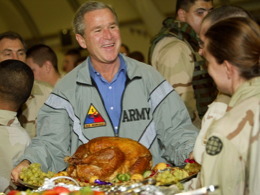 This photo appears to show President Bush serving dinner to troops during a surprise visit to Iraq on Thanksgiving Day, 2003. 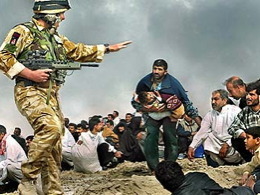 The image was widely published and credited with helping the President's popularity rise in polls. But the image was later criticized for being misleadingly captioned, because newspapers failed to mention that Bush was holding a decorative centerpiece not intended for consumption. The troops were actually fed turkey from steam trays. This digital composite slipped past the editors of the LA Times and ran on the paper's front page. A New York Times photographer was accused of staging this photo "like a fashion shoot." When Time magazine used a mug shot of O.J. 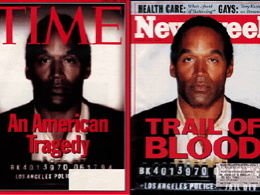 Simpson on its June 27th cover (left), it darkened the photo and reduced the size of the prisoner ID number. 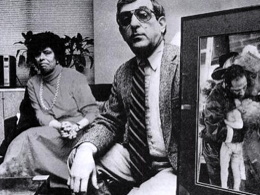 However, Newsweek ran the same mug shot on its cover (right) that week, without altering it. The two covers appeared side-by-side on newsstands, making Time's decision to darken the photo far more visible. Critics charged Time with racism. 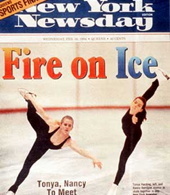 Harding and Kerrigan were seen skating together on this Newsday cover, but the scene never occurred in real life. 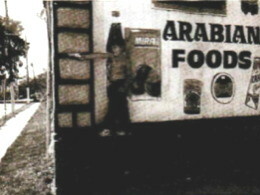 An editor digitally removed a Coke can from this front-page image because he felt it ruined the composition of the photo. 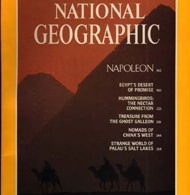 In what became the first high-profile example of digital photo manipulation, National Geographic moved the pyramids slightly closer together to fit within the frame of the cover. The news photographer staged the scene by having a fan write the phrase "Yeah Eckerd" on the soles of his feet.